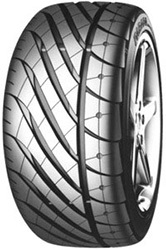 Designed for high end SUV, the Yokohama Parada Spec - X is a stylish tyre in large sizes from 20 to 26 inches. Scoring incredibly well in EU wet braking tests the tyre will offer superb grip in both the dry and the wet, and the comfort is unparralled against other tyres in it's class. The Yokohama Parada Spec - X also has the same technology as it's passenger car equivalent, designed to stop uneven wear of the tyre. Great control, and great fun, the Parada Spec - X is truely a high end tyre for a high end SUV / 4x4.